This summer while many European vacationers bask on sunny Mediterranean beaches, out in the water, hundreds of people are fighting for their lives while an increasingly more complex and robust collection of maritime non-government organizations (NGOs) (see Table 1) alternatively try to rescue them from drowning or send them back to Africa. 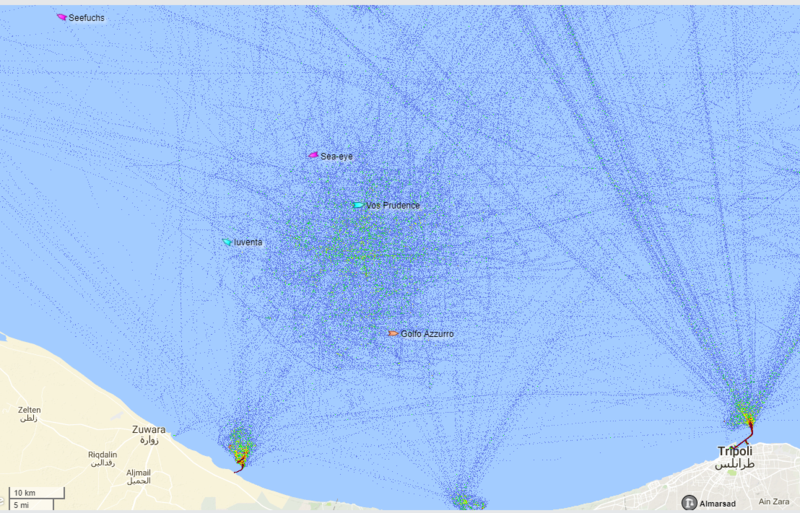 The line between maritime human trafficking and a flow of refugees at sea has been blurred. In response to the ongoing migrant wave, the group Defend Europe recently raised enough money to charter a 422-ton ship, the C-Star, to convey a team of its activists to Libya. They arrived in the search-and-rescue zone off the Libyan coast on August 4-5. The authors understand the complexities of this situation in the central Mediterranean particularly with regard to strongly held political positions by both sides. We try not to take sides in political battles, especially as we sit on the board of directors of the Center for International Maritime Security (CIMSEC). Our interest is simply to discuss how organizations use the sea as a venue to proactively accomplish their own goals and deter their opponents’ goals. Our piece at War on the Rocks discusses the search-and-rescue NGOs and the approaching counter-NGO ship C-Star. As it has arrived on station off Libyan territorial waters, we spoke with Thorsten Schmidt, spokesman for Defend Europe. What is the C-Star’s mission? “We came to the conclusion,” Schmidt says, “to get activists who are independent and fair. We need to get our own ship to get people there and to observe the left-wing NGOs.” Schmidt contends that the media has been embedded with the NGOs and therefore have a bias in support of their work. When asked if C-Star had an embedded reporter or asked for a reporter from any media organization, he stated that they just wanted their own activists to report with cameras. The search-and-rescue (SAR) NGOs have operated between Libya and Sicily for two years. When Defend Europe began to consider their own maritime mission, they were approached by the owner of a ship to charter. The ship was the C-Star (formerly the Suunta – a Djibouti-flagged floating armory in the Red Sea). The owner is Sven Tomas Egerstrom, formerly associated with the Cardiff-based Sea Marshals which he was terminated from on 26 March 2014. Although there have been some questions as to whether C-Star has armed guards aboard, it is unlikely. Schmidt told us that the ship had no weapons aboard. More practically, we assessed in our previous piece that Defend Europe does not have the funds to support a ship for an extended mission beyond two weeks as well as the more costly endeavor of an armed guard team. Ships transiting the Gulf of Aden will only pay armed guards for a few days. That is a function of both need and cost in higher-risk areas. The ship was detained both as it transited the Suez Canal and when it pulled in to Famagusta, Cyprus. It is unknown what exactly happened. Several reports suggested the ship had false documents or was transporting foreign nationals to Europe. Schmidt states that in both cases the authorities found nothing on the ships. Once on station, C-Star will spend a week in the company of search-and-rescue NGOs and on the lookout for both migrant boats and human traffickers. Their cameras will be their weapons. According to Schmidt, nine out of ten migrants using the sea do not migrate from war-torn countries as refugees. When they reach the Libyan coast, he says, human traffickers put them on gray rafts and enough food and fuel to get to the 12 nautical mile territorial limit of Libya where search-and-rescue NGOs then pick up the migrants and take them to Europe. The traffickers use smaller, high-speed boats to follow the rafts then, when the NGOs have rescued the migrants, the traffickers take the motors and return them to Libya. Schmidt notes that in some cases, the traffickers join the migrants so that they can establish networks in Sicily and beyond. Italian authorities in Lampedusa this week seized the Iuventa, owned by the SAR NGO Jugend Rettet, accusing them of aiding and abetting traffickers. If C-Star encounters a migrant boat in distress, Schmidt says it will render assistance first by notifying the MRCC in Rome, and then bring them aboard. According to Schmidt, the ship has “hundreds of life vests.” When asked about how it might accommodate for potentially dozens of refugees from a boat in distress, he says “the ship is fully equipped with an extra amount of water and food. Of course there are several activists on board with medical aid skills.” Instead of taking the migrants to Sicily or other European ports, they intend to take the migrants to closer, non-European ports such as in Tunisia. It is unknown if they have secured the diplomatic agreements to make those transfers happen. Defend Europe argues that this makes sense since there are closer countries than Italy that aren’t unstable like Libya. 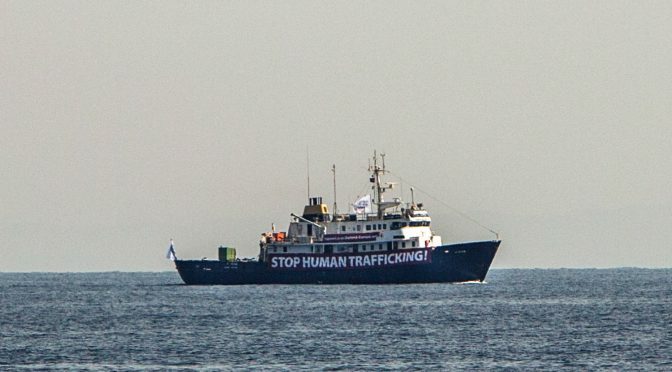 Defend Europe wants an end to human trafficking but, as Schmidt says, “we are just one ship and you can’t stop it with just one ship…We are an avant garde but need help.” Though they have an abbreviated mission this time, the $185,000 they have raised ensures that they will look to a second and third mission. Already, he says, two more ship owners have contacted them. Claude Berube teaches at the United States Naval Academy and is an officer in the Navy Reserve. He has published three non-fiction books and two novels. Follow him on Twitter @cgberube. Chris Rawley is a Navy Reserve surface warfare officer and entrepreneur. Follow him on Twitter @navaldrones. Rawley and Berube frequently write and speak on maritime organizations and both serve on the Board of Directors of CIMSEC. The views expressed are theirs alone and not of any organization with which they are affiliated. Certainly a thin line between rescue of shipwrecked and facilitating illegal immigration. I do realise it is a complicated political and ethical situation. However, I find it somewhat odd that Defend Europe’s ideological connotation is not mentioned at all. Identitarians occupy a spot on the right fringe of the spectrum in Europe. I’m not claiming the article I’m posting here is unbiased (or even fair) but I think the article could use a counterbalance. The subject is too much important to be hijacked by some far right group. And as said, the situation is complicated, both politically and ethically. – The overwhelming majority of migrants are not refugees, and as such without any legal right to seek asylum in Europe. – As warned by UK’s House of Lords and the Libyan coastguard, the more rescue units that you will deployed, the more you will encourage the smugglers.